We can arrange for your sword to be sent to shinsa in Japan. We will do all the paperwork and legwork for you, arrange for the sword to be shipped, fully insured, to our Japanese contacts, and keep you up to date on progress. Contact me for a quote. How much does shinsa cost? You should also note that the NBTHK charges non-members 2,000 yen extra for each item submitted to the Hozon and Tokubetsu Hozon shinsas. We will therefore need your NBTHK membership number if you have one. Only NBTHK members can submit swords for a Juyo Token shinsa. There are also other charges on top of the shinsa fee, such as registering the sword with the Japanese police, customs clearance in Japan and the UK, and postage/courier charges plus insurance for the sword to and from Japan, and from us to you. Any extra work that you want done, such as polishing, a shirasaya, a new habaki, or new koshirae can also be arranged to be done at the same time, though this will involve extra charges. In short, you send the sword to us, tell us your requirements, and we do the rest. Our fee for doing all this legwork and paperwork, and generally keeping an eye on your sword for the duration, is £150 per sword and £50 for koshirae. We require a deposit of £250 per sword and £50 per fitting or koshirae. When all work has been completed and the sword plus certificate is back with us, you will receive an itemised account of charges. The balance is to be paid in full. How long does shinsa take? Shinsa results are usually issued in the last week of the month following the shinsa - for example, the results for the January shinsa are issued at the end of February. However, there are frequently delays due factors such as holidays or the large amount of submissions. We will therefore notify you of the results by email, fax, phone or mail on the day we receive them. The sword's is released by the NBTHK approximately 2-3 weeks after the results are issued. A further two weeks is taken up waiting for Bunkacho clearance, after which the sword is shipped home. 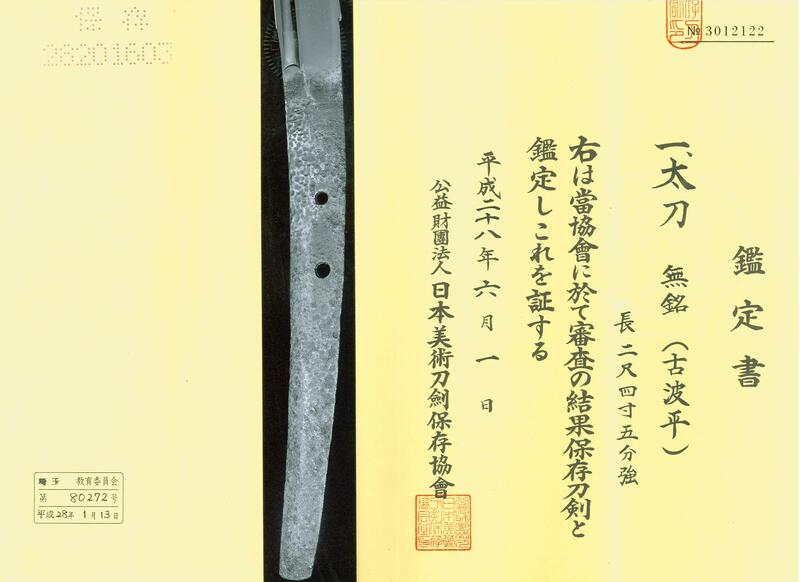 As a rough guide, it takes about 3-6 months for swords submitted to the Hozon Token and/or Tokubetsu Hozon shinsas. Swords submitted to a Juyo Token shinsa average about 6-20 months. Allow another 2 -3 months if you want a sayagaki. You will receive your certificate around the same time as your blade. If your sword is awarded Juyo Token status the blade may, if space is available, be selected for display at the Sword museum. You will receive your certificate and a copy of the relevant page from the Juyo Token Nado Zufu book in approximately a year to eighteen months, as they need time to do photography, oshigata, and a write-up on the piece to be included in the Juyo Token Nado Zufu book. When should I send you the swords or the fittings? We advise you to send your sword only if it is in a presentable state. There is absolutely no point in submitting a rusty blade in the hope that it might be declared valuable; the judges won't be able to see the characteristics of the blade and will therefore be unable to make a proper assessment of it. As a result, you will have wasted your money. This is not to say that such blades aren't salvageable - in fact if you have a rusty blade and want to do something with it, contact me first, and I'll see what can be done. For shinsa, however, you need to make sure that the blade is in good condition before it is submitted, even if that means asking us to get it polished prior to submission. If the blade is in decent condition but lacks a shirasaya or koshirae, get one made before submission. After all, you need to protect the blade from damage, and protect all those who handle the blade. If you wish, we can arrange to have a shirasaya made. Finally, please put the blade in a shirasaya bag or koshirae bag otherwise we will do this for you and add it to your bill. In addition, make sure that the sword is well packed before sending it to us. I have seen swords badly damaged (e.g. tip of the kissaki broken off) because owners didn't pack the sword well enough, If you need any advice on packing, contact me .